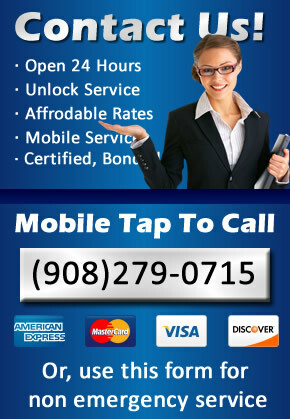 (908) 279-0715Need A Locksmith? Call Now - We're Open. Locksmith Elizabeth NJ is a 24-hour mobile emergency locksmith serving Elizabeth New Jersey and the surrounding communities. We have been in business since 2008 an employee for full-time locksmiths. Each of our locksmiths are certified in their respective fields. At Locksmith Elizabeth NJ, we can help you with all sorts of locksmith services such as: car key replacement and repair, residential locksmith services, commercial locksmith services, rekeying (changing the locks) your house, apartment, or condominium or just about any other locksmith service you can think of. At Locksmith Elizabeth, NJ we strive to keep our prices competitive and affordable for our clients. Don’t fall for those locksmiths promising you cheap prices only to turn around and charge you to the roof. For less than $20 we will come to your location, take a look at the work you need done with our own eyes, and give you a firm estimate right on the spot. it’s very hard for any locksmith to get the price over the phone. This is because there are many factors involved with every job. Some of these factors include: the security level of the lock, the complexity of the lock, the age of the lock, etc. Give us a call and let us know what time you’d like us to be there. Will be happy to come out take a look at your job and give you a quote. Yes, we are fast! If you’re in an emergency situation, we know how important this is to you. Our dispatch office uses the latest technology to pinpoint your location and the location of our nearest technician. This technology allows us to send a locksmith to you fast. Our 15 min. responses become famous in the Elizabeth area. they even wrote an article about us on NJ.com. so when you need a locksmith there fast, be sure you call locksmith Elizabeth NJ. We’d be happy to help you. Locksmith Elizabeth NJ provides 24-hour emergency locksmith services as well as by appointment. We realize that not every job as an emergency. If you need something like your locks rekeyed or a car key made and it’s something that can wait until tomorrow, no problem. Give our dispatch office a call now and one of our friendly operators will be happy to set up an appointment for you. Thank you for visiting and thank you for your interest in Locksmith Elizabeth NJ.